What are the Benefits of Guided Math Groups? Adapted from: Fountas & Pinnell (1996) Guided Reading: Good First Teaching for All Children. Thank you for your research to back up this fantastic world of guided math groups! 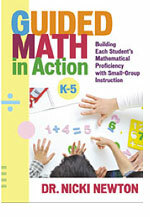 I am excited to begin guided math in my classroom this fall. You are very welcome! I love this stuff. Please write and let me know how it goes and don’t hesitate to ask questions!